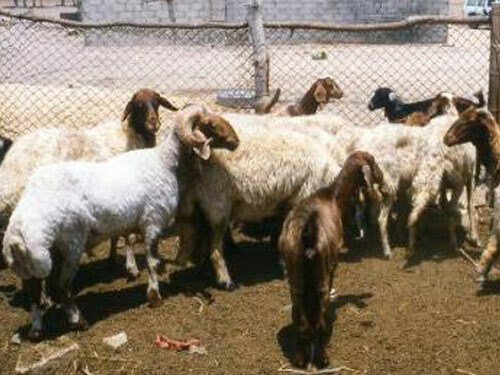 Ossimi sheep originated in the Ossim village in the Giza Governorate of Egypt and are the most popular among the Nile and Delta sheep breeds. They are thought to be expanding their range at the expense of other breeds. They are adapted to variable conditions and are usually raised under intensive cropping conditions. They are a medium sized sheep, narrow, with a shallow body and long legs. They are multi-colored, usually white with a brown head, neck, and legs. They produce coarse/carpet wool and have a fat tail. Rams are horned.